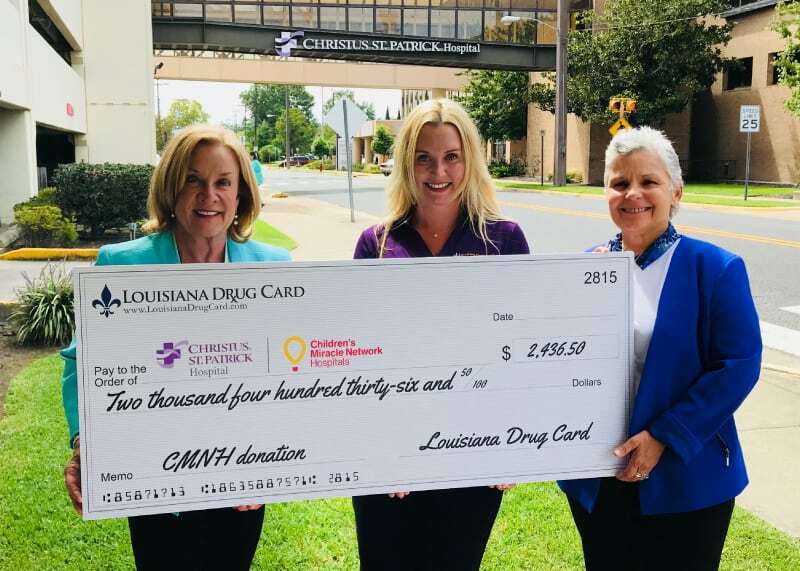 On Thursday, August 30, 2018, Louisiana Drug Card presented a check to the Christus St. Patrick Hospital in Lake Charles, LA. Please help us support the Children’s Miracle Network Hospitals by using Louisiana Drug Card for a discount on your prescriptions at your local pharmacy. Louisiana Drug Card has been working closely with Louisiana State Medical Society, Louisiana Business Group on Health, CHRISTUS St. Patrick Hospital along with numerous clinics and hospitals around the state to distribute free discount prescription cards so that all Louisiana residents will have access to this free program. A donation is made to the local CMN hospital each time a prescription is processed through Louisiana Drug Card. Since 2015, the United Networks of America partnership with Children’s Miracle Network Hospitals has raised over $2.4 million dollars for local children’s hospitals. Of this, $2,436.50 has been raised for CHRISTUS St. Patrick Hospital. Christus St. Patrick Hospital provides professional health care services for children from newborns through teens, whether they have been injured, have serious illness or need regular checkups. Skilled pediatric specialists provide outpatient care for children and offer routine well-child health care, and also treat many chronic and serious conditions that affect children.